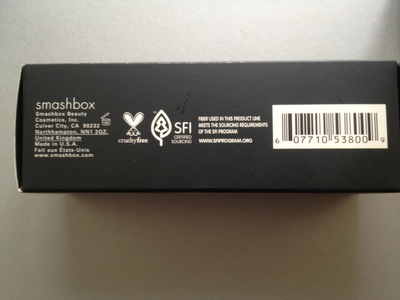 Smashbox: some never heard of it, some can't do without it. It's for sure I belong to the second group when it comes to the primers. Today I review the Photo Finish Foundation Primer. 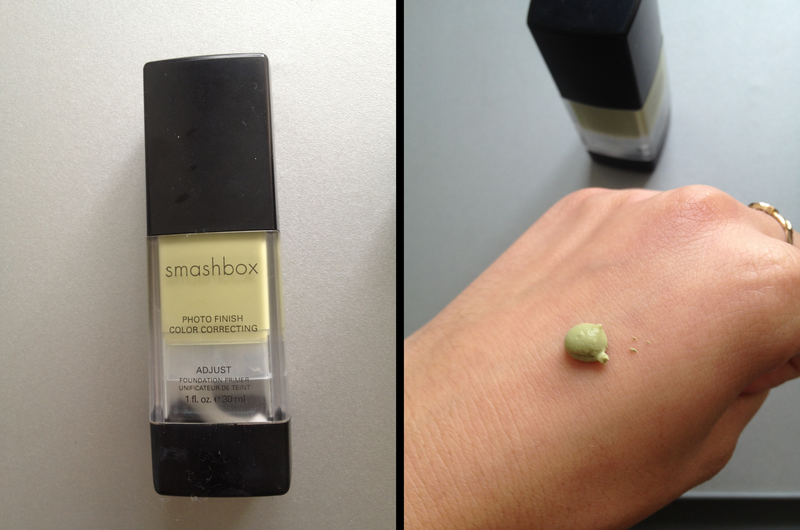 Smashbox promises "a perfect canvas for foundation application with this silky blend of vitamins A & E, grape seed extract and green tea." Let's take a look at the primer. 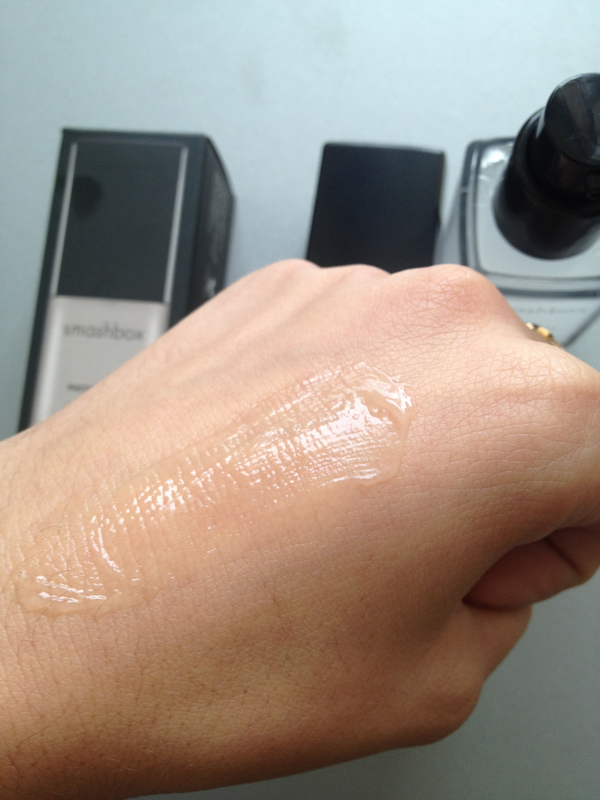 The primer is a clear substance in a square bottle with a pump. That's a biiig pro, because it's more hygenic and it makes it easier to estimate the amount you need, without using too much. The packaging is very simple and sleek. There's only one shop in The Netherlands, that I know of, that sells it. Luckily it's near. There are cosmetic stores that haven't heard of Smashbox at all. Depressing. I know. In the past I used the green version of this primer. The green colour reduces any redness on your face and I coped with a lot back then. Now not so much, that why I picked the clear version. I've had this green one for over a year. I know you shouldn't keep your makeup products that long, that's why I bought a new one. I did notice it didn't apply that smooth anymore, when I put some of this on my hand. It had little chunks in it. But back to the product I was reviewing! Like I said, it's a clear substance, reminds me of a gel, but it isn't. It has a very light, very subtle mint smell. I like it. 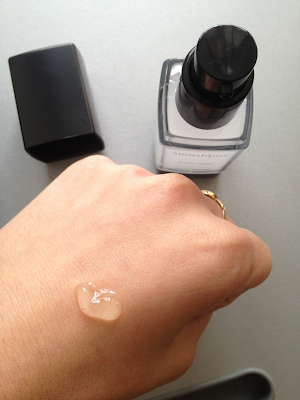 The primer feels silky smooth and it spreads out really easily! After spreading it, your skin feels silky silky silkyyyy smooth. Fine lines and pores are actually reduced, like the product said. Applying foundation is so easy with this primer, that's why I love it. You also need less foundation and it applies so easy. It just glides over your skin, because of the primer. Sometimes foundation gets into my pores, which makes it all icky and ugly, but I don't have this problem with the primer. Don't get the idea that your face is a "perfect canvas" after using this primer. Smashbox may promise that, but the effect is not that big. Big pores are still visible, unfortunately. For an even smoother application I mix some of the primer with my foundation. I know it's not meant for that, but it makes applying foundation even easier. Sometimes I use the primer without a foundation, over my day cream. It doesn't do much then, but I have the feeling it makes my skin a little more smooth and that my other products (blush, bronzer) last a little longer. 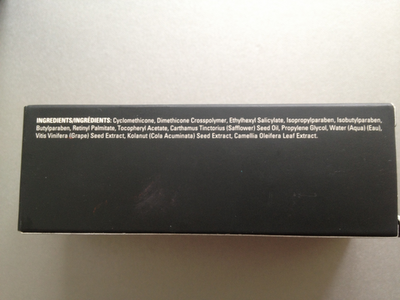 I did a little research on the ingredients and the primer contains quite some silicones. That explains the smooth finish. 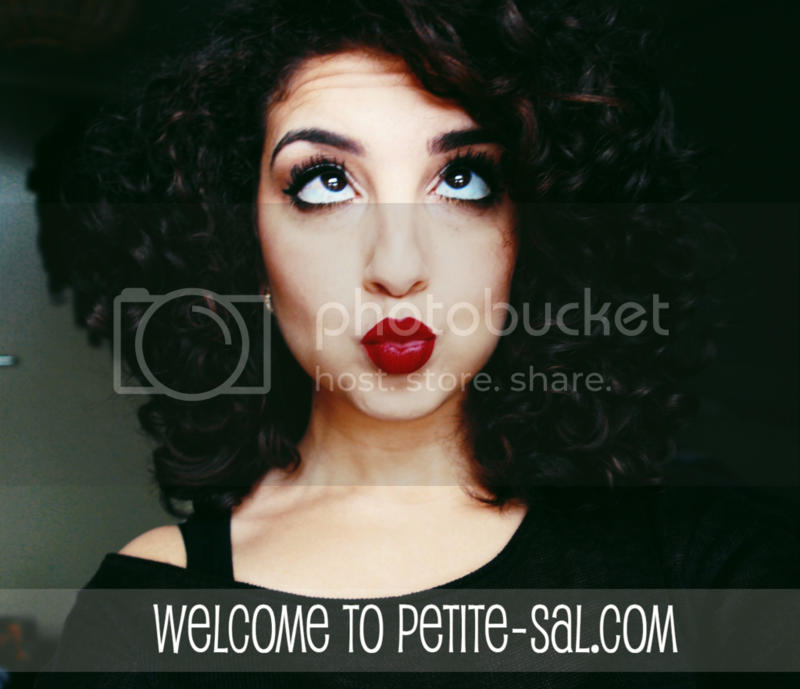 Now, I don't mind silicones in my product. It also contains parabens, vitamin A, vitamin E, safflower seed oil, a chemical to prevent melting and freezing, water, grape seed extract, kolanut seed extract, extract from the camellia oleifera leaf (tea plant). I don't know the price, unfortunately. I sent my mom to buy me the primer, since I had no time, and she lost the receipt. Last year, when I bought the green one, it was around €20 with discount, if I remember it well. Would I repurchase this? Would I?? I already did! I'm also planning to buy more Smashbox products. But I certainly love this product. It's amazing for my skin. Maybe it's because the product is amazing, maybe it's because the match with my skin is amazing. Who knows? At least I know that I can't apply foundation without my favuuuuurrrrite primer. I love you, Smashbox. What are your experiences with Smashbox? And what is your favourite primer? I'd love to try this but I've also read great things about MUFE's primer and that one it's silicones free! I am looking for a good primer. I have one from sephora but I don't like it! Where can you find smashbox products in Holland? I didn't found it in the stores. Like the article by the way! Lovely review, would love to try it. Great review! - I would love to try this sometime. I am currently using Benefit POREfessional! Ga het een keer proberen! 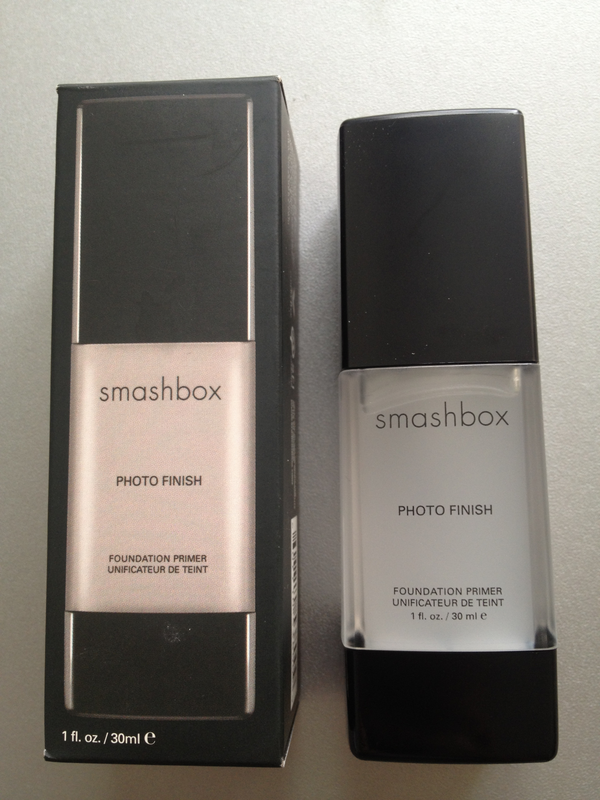 Maybe a bit behind the times but only just hearing about smashbox and they seem to be everywhere. thanks for this review. I've been wanting to try this. Do you find it makes your makeup last longer?